Some less well used and/or known forms of otherwise well known veggies: red celery, multi-color baby potatoes and yellow beans. Cucurbits in the form of flavorful melon cucumbers, a hybrid variety originating from Italy, and small but fragrant Charantais melon. And, a nutrient-rich and pretty find: borage. The Farmers Market vendor suggested making pesto with it, which is what I set out to do as a start, to eat with the potatoes. Borage does not have a very distinctive taste but it seemed to pair well with pine nuts and pecans based on a quick check. So that is what went into my pesto, in addition to olive oil, the green of one spring onion, a bit of parsley, salt and pepper. I skipped the garlic as I was looking to keep the plate low in FODMAP that day. But obviously, it could be added. Red celery has a nice sweetness to it, and I combined it with the yellow beans that I had steamed until cooked but firm, some pecan pieces, parsley, and a simple blueberry vinaigrette for a second salad on the plate. For the vinaigrette, I used olive oil, apple vinegar, a little blueberry extract, salt and pepper. Finally, the third salad was a simple refreshing combination of the melon-cucumber, sliced, small balls of the melon scooped out with a melon baller, salt and pepper, a little Farmers Market honey, lemon juice, mint and a little marigold, and olive oil. The result was a very seasonal, mid-summer Meatless Monday salad plate. More seasonal and Farmers Market inspired Meatless Monday ideas on the way! Borage is rich in important fatty acids, omega-3 in particular. I found it at the SF Ferry Plaza Farmers Market, but it can be foraged. 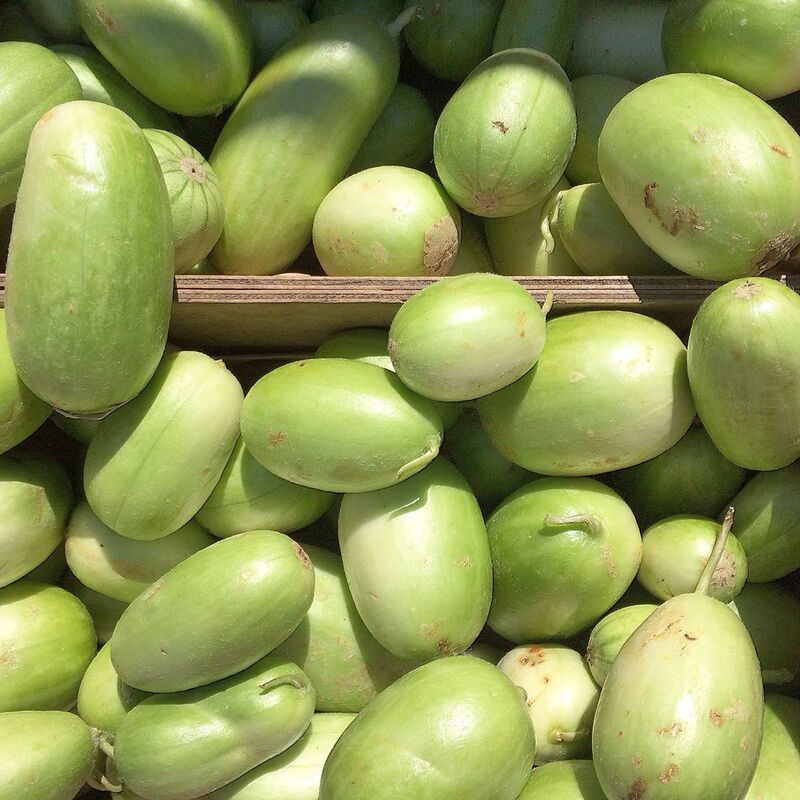 The melon-cucumbers, quite a tasty breed, were from my local Market, but can be replaced by other cucumber types. Same for the melon. The combination is really what matters. For the yellow bean salad, some shallots would have been a good add too, if FODMAP is not a consideration. This plate is low in FODMAP, gluten-free and dairy free. It can be made vegan if not using honey.